Prime Minister Justin Trudeau answers tax question during Question period on Monday, September 18, 2017. Credit: CPAC. Liberal MP Wayne Easter, the chair of the Commons finance committee said the communications surrounding the roll-out of the Tax Planning Using Private Corporations consultation “was just god-awful.” What he didn’t say was that there was a problem with the proposed changes. And there definitely are problems with the proposed changes. This will absolutely hurt the tech and innovation community. Nicole Verkindt, OMX. And therein lies the beginning of the messaging problem the government created for themselves. It makes it sound like law abiding businesses who are using the existing legal tax code provisions are guilty of cheating the government and are using loopholes to circumvent the system. That’s just wrong. There is no loophole. The tax code was enshrined into law with the exact purpose of providing mechanisms for Canadian-controlled private corporations to save on taxes. What the government is trying to achieve is to level the tax playing field. Ok. That sounds fair. And they are trying to do it in such a way that individuals who own Canadian-controlled private corporations who are making a lot of money pay more taxes. In other words the richest Canadian-controlled private corporations will pay more tax. Once again, that seems fair. The problem though is that the proposed changes are sweeping, and intentionally or not, they target all Canadian-controlled private corporations, not just the rich ones. On Monday evening the TVO show the Agenda with Steve Paikin had a somewhat balanced segment on the tax issue. Verkindt isn’t the only one sounding the alarm. Business associations across the country are lining up and working together to get the government to back down. This includes the new Coalition for Small Business Tax Fairness which has now grown to 63 associations from its 35 associations and represents thousands of members. SpaceQ contacted the two leading aerospace associations for comment. A spokesperson for the the Aerospace Industries Association of Canada (AIAC) said “it’s not something our members have raised with us as an issue.” That puts them in the minority of Canadian industry associations. The three issues the government is currently targeting are income sprinkling, passive investments and capital gains. These can be quite technical issues and below are the government explanations. The Globe and Mail had a somewhat simpler set of examples. Sprinkling income using private corporations, which can reduce income taxes by causing income that would otherwise be realized by a high-income individual facing a high personal income tax rate to instead be realized (e.g., via dividends or capital gains) by family members who are subject to lower personal tax rates (or who may not be taxable at all). Income sprinkling example. Credit: Government of Canada. Holding a passive investment portfolio inside a private corporation, which may be financially advantageous for owners of private corporations compared to other investors. This is mainly due to the fact that corporate income tax rates, which are generally much lower than personal rates, facilitate the accumulation of earnings that can be invested in a passive portfolio. After-Tax Comparison. Credit: Government of Canada. 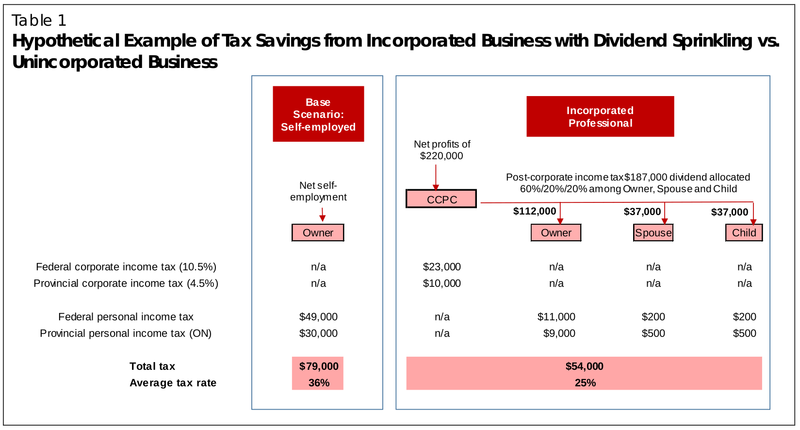 Converting a private corporation’s regular income into capital gains, which can reduce income taxes by taking advantage of the lower tax rates on capital gains. Income is normally paid out of a private corporation in the form of salary or dividends to the principals, who are taxed at the recipient’s personal income tax rate (subject to a tax credit for dividends reflecting the corporate tax presumed to have been paid). 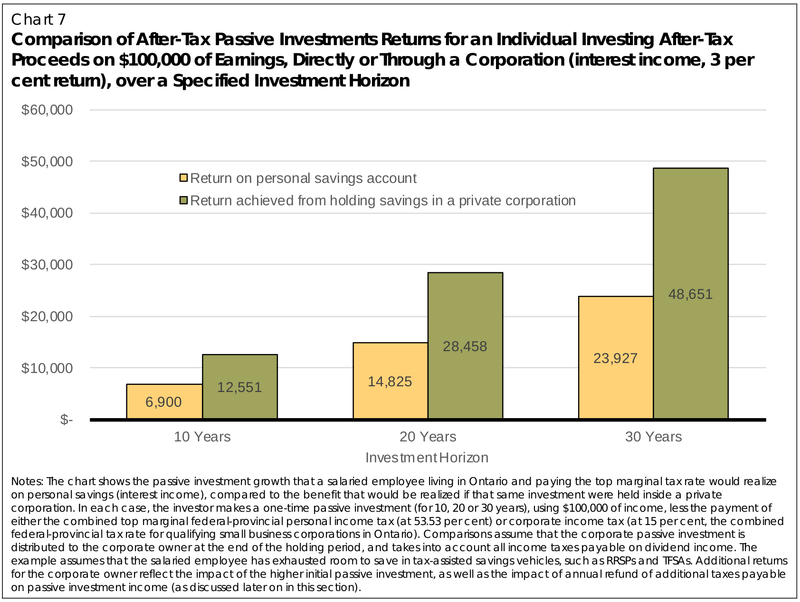 In contrast, only one-half of capital gains are included in income, resulting in a significantly lower tax rate on income that is converted from dividends to capital gains. There is no doubt that the government bungled the messaging surrounding this tax reform initiative and compounded it by their continued insistence that it will only affect the rich. Small businesses are uniting against the current proposal. Entrepreneurs and investors are worried. The consultation process is ongoing with a closing date of October 2nd. You can bet the opposition parties will hammer away at this issue everyday. They may have found an issue that could be used against the Liberals in the election in two years. The government though has time to fix this mess. The messaging has to change, the substance of the proposed changes needs further consultation. Tax reform must truly be fair for small businesses and those entrepreneurs that chose to take the risky path of creating a new company that contribute jobs to the economy.